Aslan's Own | Life Happens, Be There! Feet are weird. We almost forget how much they serve us until they hurt. Weird, huh? But now that I don’t wear constricting conventional footwear they are feeling much better. I’ve been on this quest lately – to create art. Be artistic, creative, crafty. I’m trying all sorts of media that I’ve either never tried before or tried so badly and with an attitude it doesn’t count. As I look around at what people create and call art – I’m constantly inspired. There is art in everything! Obviously – from knowing me or following me on social media you know photography is something I love to do. Creating art by seeing a picture in nature, in life. And grabbing it. Quick. And the extra special ones I print on canvas and hang on my walls. Some days I just want to photograph everything that other people have created – old barns, fences, doorways etc. And some days I want to make the thing instead of photograph it. You know what’s been on my mind to try? A garden gate. I want to build a garden gate. From recycled pallet wood. Watch for it. So right now I’ve been working on painting with acrylics. I’m also working on crocheting my first scarf. I just finished creating an inside avian flight habitat – using large cages, natural and fake plants and lovely birds. Art. The acrylic painting in interesting. I paint like I’m six years old. I hold the brush and seem to use it more like a sketch pencil than a wet paint brush. It is extremely humbling. Can I improve, can I get good enough to please myself? Stay tuned. The crocheting is much easier. My dear sister-in-law, Rita, taught me how when I was in New England last week. She’s a lefty, I’m a lefty, I got it. (well, the first easy stitching part anyway) I’m making my first scarf. It feels like a practical, useful form of art – you can do it while your visiting or watching a movie or waiting for something. Drawing is on the list. A good website I found says that, yes, I can learn to draw. It is a skill that can be developed. So, back to the painting. While sheepishly staring at the ones I just finished, I thought of the art I have created that is in my house now. A couple of pieces – the tiny willow table and the embroidered horse, I did a while ago. The others are from more recent. Off I went to photograph them all, confirming in my mind, that yes, I’m artistic, creative. So do it. Keep doing it. What have I gone and DONE? Take back ownership of my mouth and body, that’s what. I started late last fall looking like this. Five foot six inches tall and two hundred and twenty-five pounds. I’ve been up and down from that most of my adult life, but never have really been able to get a real grip on my eating habits. But I have, I finally have. No, seriously. I began last fall to begin to cut back on things like candy, pasta, bread. Smaller portions, healthier options of food, much less sugar. Then I added in various exercises, walking, a bit of running, long hikes, doing cardio and strength work with YouTube videos over the winter. Getting a little movement coaching from my son, Justin. I also began really looking at why I ate so much all the time and I came to the conclusion that overeating for me was not only a bad habit, but had emotional roots that needed to be dug up and ripped out. I’m happy! EAT! I’m MAD! EAT! I’m sad. EAT!!! EAT! EAT! I am fully aware that our Standard American Diet was developed to make us want more, more, more, which doesn’t help anyone trying to eat healthier. In fact, when one does pass on dessert, bread, soda, candy, it usually raises the eyebrows of those around. Too bad. Then February happened. I somehow came upon the book The Primal Blueprint by Mark Sisson. Then I read his 21-Day Transformation book. I read every. single. word. in those books, joined his email list, got his free Primal Fitness book. Soaked that up too. By March I was down 25 pounds and feeling super encouraged, so I committed to 30 days of Primal eating. No grains, no legumes, only healthy oils and fats and very little sugar. (My treat is a little sugar in my morning coffee and one square of a high quality chocolate bar after dinner. Oh, and wine. Yes. Wine.) Lots of vegetables, good quality meat and fish protein, limited dairy. For more detailed info, get Mark’s book or check out his website! Me, March 2016. 199 pounds. Interestingly enough, March was not as hard as I thought it would be. I went cold turkey, no cheating, no treats of bread, pasta, tortillas, beans. Or M&M’s. I also began adding in the primal fitness plan. Weekly sprints, squats, planks, push-ups and pull-ups. Baby ones, starter ones, but I did them. I LOVE the fact that in Primal Fitness – there are 4 levels to get up to actually doing a real push up or squat or any of the others. You can always do SOMETHING for fitness even if you start out very small. Five wall push-ups. Try it. By the end of March I’d lost NINE pounds! I ate well, moved well and felt fantastic. Not only that, but I also decided to stay with the Primal Blueprint way of eating indefinitely. Me, May 2016, 40 pounds gone! 185 pounds. So here we are in September. I am still eating well, doing sprints weekly, doing my 2 circuit work out of squats, planks, push-ups and pull-ups about twice a week and long walks and hikes as often as I can. I reset my goal weight three times. Originally 155, then 150, now 145. That is where I am keeping it and I will see how my body feels when I get there. I know for many people the scale isn’t the thing. But for me it is. I need to see the belly go down and the numbers go down. I weigh myself every day. I only ever record losses in weight. If I’m up some for a day or two – I don’t record that. I work at it until I can get the number down. It is highly rewarding! The way I look and feel now – 20 more pounds does not seem excessive. The belly (and residual back fat!) has got to go. I also just cleaned out my closet, donated two bags of fatlady clothes and altered 3 pair of stretch denim jeans to fit me through this last transition. I no longer enjoy baggy jeans! As my body adjusts to the freedom it has now, I’m beginning to cut back portions again. Believe me, I am not hungry much! I eat well. But I’m finding that I just don’t need the quantity of food – even if it’s a great salad with BBQ’d chicken – that I used to need. If I get hungry between meals I have a handful of almonds, a cup of tea or a small slice of my favorite sharp cheddar. I’m also no longer tempted to eat things that called to me all the time before. It is just not worth it. I feel so much better, mentally, physically and emotionally than I have in a long, long time. Yours truly, September 2016. SIXTY pounds gone. 165 pounds. Took a walk along Sand Creek the other day, scoping out where I’ll begin leading my first bird walk in quite awhile. It was clear, cold and beautiful and I saw some lovely birds. This first beauty – Red-tailed Hawk – but no red tail? Closest match in the Sibley Guide seems to be a Southwestern Juvenile. The next two photos are of the same bird. Very pale tail – missing many feathers. Here is a little beauty – any guesses? These two are fun! The larger bird is new and I believe the smaller one is the same bird as the one in the first photo. I’m always amazed at the differences in Red-tailed Hawk plumages. Some hanky-panky going on here I think. And THEN such a glorious surprise right above my head! I believe this is a 3rd year Bald Eagle. There were actually two of them, both juvenile birds. And then someone found ME. Now you see her. Posted in Birds	| Comments Off on Winter Hawking, with Eagles and a Surprise. My sis Lauren and I spent the day wandering the prairie in eastern Colorado. We found someone’s home, once loved. Mrs. Jack R. Abbit. Check out those EYES. And we found THIS: A stunning Short-eared Owl that flew up from almost under our tires and almost caused Lauren to land in my lap. Found this beauty – a Common Nighthawk, sleeping on a post near a busy, dusty gravel road. These beauties – Northern Pintails I think, were in a prairie puddle or playa. In the middle of a grass desert. See them? Cool old barns here and there with many Stay Away warnings. I’d like to know the stories here! And these two. Beautiful Pronghorn. Yes, you read that right, we are. After graduating our 11th child from high school, it’s time. Al is ready to have a 20 minute one-way commute vs. a nearly 90 minute one-way commute. We looked at a LOT of houses. In all sorts of neighborhoods, and found this one. Nice remodeled home on nearly a half acre in a quiet subdivision with lots of trees in SE Aurora. Just across Cherry Creek State Park from Al’s office. Easy ride for him, pretty spot for me and the dogs. Oh, and it’s NOT a fixer upper. We’ve had enough of those! We’ll be heading down there in September, and hopefully will have our house here on 9E sold by then! In the meantime, I’m working with my puppy Badger, getting him ready for showing, taking hikes, going swimming and having coffee with friends. Not to mention keeping the house show-ready for prospective buyers. Still enjoying summer here at Kingfisher Cabin as well! The snow is finally beginning to clear, we’ve had it on the ground since Christmas I believe. Here is a lovely forest near Sisters, Or. It has been a pretty good winter so far, we visited Josh and Mary in Oregon for Thanksgiving, had a nice Christmas at home. Seriously contemplated selling and moving south of Denver, closer to Al’s work, but decided against it after looking at houses for over a month and just not finding anything as nice as this any closer to his workplace. The Evening Grosbeaks visit now and then. The are the most beautiful birds. Day after day we’ve been showered with unbelievable color. It reminds us how blessed we are. How we are so fortunate to live in this lovely place. How every day has it’s own beauty. Before the ice froze up we had a lake full of Canada and Cackling Geese. I also found one Canada Snow Goose cross. After the water froze only the ducks stuck around. Then when it got really cold and frozen, they all left. Probably hiding and feeding in sunny spots along the edges of the river and exposed banks. Now here we are in mid-winter and the snow is gone, the top of the ice has melted and frozen repeatedly. Some days shining like glass, others a dull, soft blue. And today, Robins in the yard, everywhere, tossing leaves from under bushes, looking for live food to eat. Spring can’t be far off. There is so much to process when you have had your life turned upside down from a weather disaster. But one thing I don’t want to do is live here with one foot down the road. I need to BE here. Here is my January garden. I managed to get a hoop house put up earlier this month during a warm spell. 4 x 20 feet. I’m getting ready to get in there and plant some spinach, carrots and lettuce. 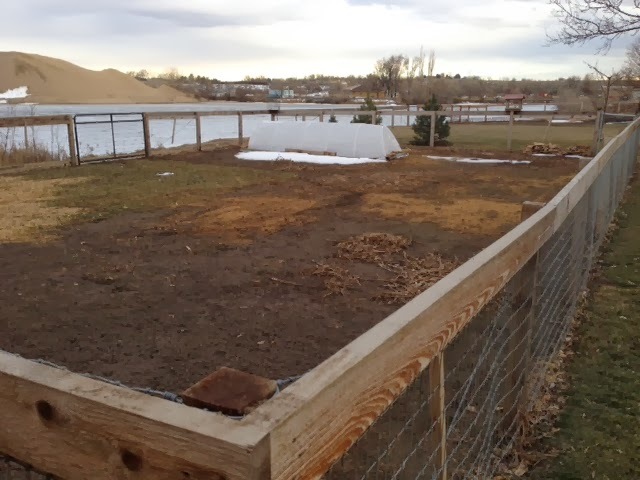 The green patch you can see on the left is wheat that I planted to give the ducks and geese some forage. We moved the duck house, and sold the ducks and geese.. but I’ll be adding some this spring again. I’ll probably till the wheat under, unless I decide to see if I can get a little, bitty wheat crop going on. 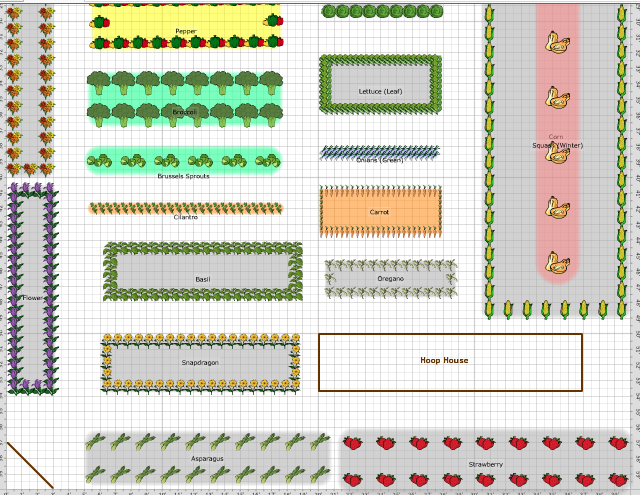 My fenced garden plot is 40 x 60 feet, which is huge. I’ll be planting a full garden this year with lots of flowers. 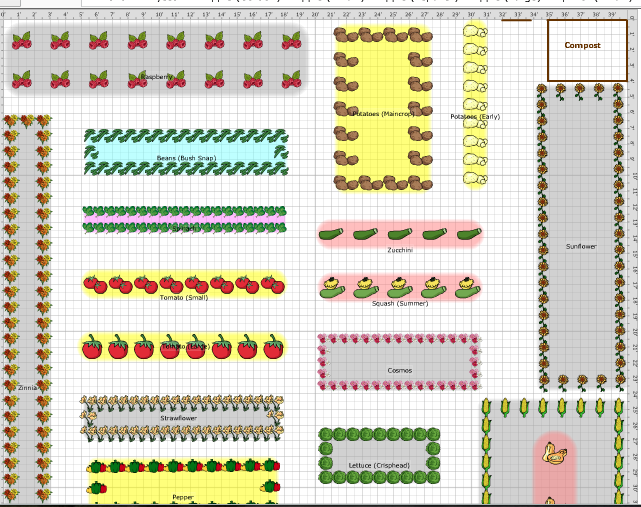 raspberries, potatoes, sunflowers, zinnias, spinach, zucchini, summer squash, tomatoes, cosmos, strawflowers, head and leaf lettuce, corn, butternut squash, peppers, cilantro, brocolli, basil, oregano, carrots, and who knows what else.